COMPATIBLE FIT with all type brands of standard sized European charm bracelet and necklace beads and charms like Pandora, Biagi, Chamilia, DaVinci, Disney, Hallmark, Kays, Soufeel, Ninaqueen, Brighton, Trollbeads, and Zable. All of us want to remember the once-in-a-lifetime experiences we’ve had, when we've struggled and triumphed, to keep the feeling of accomplishment fresh in our minds. We want to positively contribute to a person’s life. We want to help you capture those incredible experiences that are unique to you and your life’s path. That’s why we created our Timeline Treasures™ jewelry: 100% pure surgical stainless steel that won’t tarnish, fade, or irritate your skin over time. 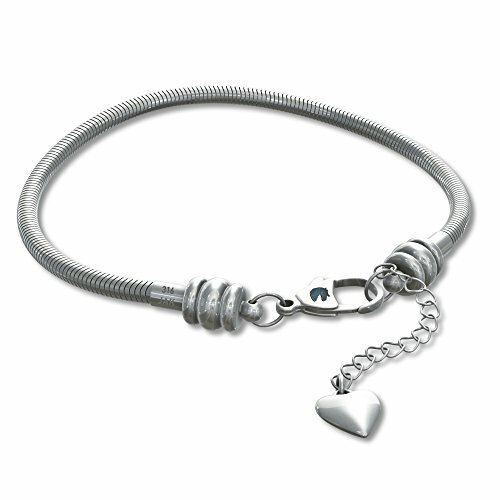 We want to provide you with a strong, forever bracelet while you collect and showcase your unique charms to the world. Maybe one day you’ll even pass it on to your kids and grandkids. Are you looking for a perfect gift to give a special woman or girl in your life? You just found it. Show her that you really thought about her. Give her our premium Timeline Treasures charm bracelet! She will cherish it, along with the EXTRA BONUS silk jewelry bag and charm that comes with it! Add Your Charm Bracelet To Your Cart Today, and Consider Getting a Few Extras for the Holidays! FREE GIFTS YOU WILL LOVE! Includes basic starter bracelet without charms, embroidered jewelry pouch, two silicone rubber safety stopper rings, Murano lampwork glass charm, and manufacturer warranty card with every order, ready for an immediate gift. TARNISH PROOF HEALTHY STEEL! Strong, hypoallergenic 316 surgical steel keeps your skin and your charms safe, with a beautiful finish that lasts forever. End unscrews to add or remove charms. Get the matching necklace set! YOUR BEST VALUE. NOTHING ELSE COMPARES! - Master 3mm cable chain with 1" extender and heart charm. Lobster claw clasp opens easily with no special tools. Sizes include the clasps - NOT the extension - and are within 1/4 inch, please see image for sizing instructions. Small children, teens, and womans plus sizes, too! COMPATIBLE FIT with all slide and threaded European charm necklaces and bracelets brands with a core size of 3.5mm and up. BEAUTIFUL color looks great with any mix of gold, silver, rhinestones, and more. Custom build your own personalized style!